A PROMINENT US journalist has accused the MDC Alliance of engaging in primitive politics that sees the party refusing to accept electoral defeat. 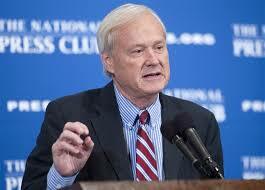 MSNBC anchor Chris Matthews said this on Tuesday while criticising President Donald Trump whom he accused of taking the US back to “tribal” politics similar to that of Zimbabwe’s opposition “who have a long history of discrediting electoral outcomes they do not agree with’’. The US establishment has been a major ally and sponsor of the MDC Alliance in its various forms since its inception in 1999. “He (Trump) is taking us back to where they are, where all the opposition (read MDC Alliance) does is say that people who win elections are crooked, that everything’s rigged, everything — nothing’s on the level, there’s no such thing as objective truth, everything is tribal, our side is always right, your side’s always wrong. “That’s my judgment,” he said. Since the formation of the MDC in 1999 before its multiple splits, it has lost elections to Zanu-PF but has always made unsubstantiated claims of electoral manipulation. The party also lost in the latest elections held on July 30 but still cried foul despite the polls getting commendations from most election observers that were invited to observe the elections. The MDC Alliance has maintained its widely condemned position despite losing its petition challenging the Presidential result at the Constitutional Court. The MDC Alliance presidential candidate Mr Nelson Chamisa lost to President Mnangagwa while Zanu-PF also retained its two thirds majority in Parliament. Political analyst Mr Tafadzwa Mugwadi said it was interesting that the MDC’s backers were now noticing the party’s true colours. “It is interesting to realise that slowly, the US community is going through its Damascene baptism in terms of understanding the foundational and existential shortfalls of the opposition in Zimbabwe,” Mr Mugwadi said. “The form and character of the MDC as a party whose centre of gravity is perennial rejection of electoral outcomes as a basis for existence and relevance in post-election discourse has become so exposed such that it becomes imperative for the MDC to change tactic. Mr Goodwine Mureriwa of Harare said neo-liberal democracy was premised on acceptance of electoral results. “The cardinal rule of all thriving democracies is acceptance of electoral outcomes and congratulating the winner rather than spending sleepless nights conspiring on how to discredit credible outcomes. “That was the mistake of Jonas Savimbi (of Angola), Raila Odinga of Kenya among many unsuccessful African politicians,” Mr Mureriwa said. He said the statement by Mr Matthews could be an indication that the US establishment was fed up with the MDC’s antics.